A divers takes photos of some of the items found after the discovery of a centuries-old shipwreck, in Cascais, Portugal, Sept. 24, 2018. Archaeologists searching Portugal's coast have found a 400-year-old shipwreck believed to have sunk near Lisbon after returning from India laden with spices, specialists said on Monday. "From a heritage perspective, this is the discovery of the decade," project director Jorge Freire said. "In Portugal, this is the most important find of all time." 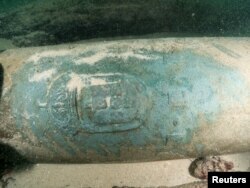 One of the nine nine bronze cannons engraved with the Portuguese coat of arms found by divers around a shipwreck near Cascais, Portugal, Sept. 24, 2018. Found on Sept. 3 off the coast of Cascais, a resort town on the outskirts of Lisbon, the shipwreck and its objects were "very well-preserved," said Freire. Freire and his team believe the ship was wrecked between 1575 and 1625, when Portugal's spice trade with India was at its peak. "For a long time, specialists have considered the mouth of the Tagus river a hotspot for shipwrecks," said Minister of Culture Luis Mendes. "This discovery came to prove it."